On the occasion of his 90th birthday, Galerie m Bochum is honoring French artist François Morellet with a solo exhibition – the tenth since the beginning of his collaboration with the gallery in 1970. On display are neon works of recent years, including the large corner installations “Triple X neonly” and “Cercle à demi libéré n° 2,” and thus a work complex that is also present in the public space. Morellet’s luminous blue “Skyline,” for example, has adorned the façade of the Kunstmuseum Bochum since 2009. 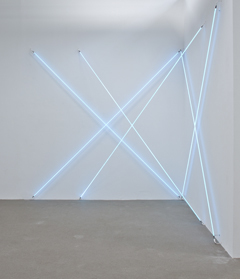 François Morellet first worked with neon tubes as a means of artistic expression in 1963. The material satisfies his vision of straightness and precision. He thereby deliberately foregoes the gestural expression made possible by artistic brushwork. Despite turning to new, technically based forms of representation, Morellet continues to reference traditional picture elements such as the rectangular image carrier and the line. 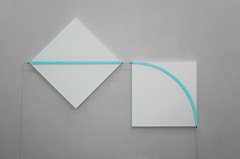 “Trop plein n°1” (2013) consists of two canvases with a blue argon tube affixed to each – a straight line and a circle fragment. The artist’s unconventional, playful handling of the image carrier is reflected in the hanging of the left canvas with one corner pointing downward. The two neon tubes are thus connected to form a continuous line that bends downward in the right half of the work. How to interpret the title, which can be translated as “too full,” can only be determined subjectively or by association. Morellet frequently provokes with his titles trains of thought that go beyond anything that can be described by mathematics or geometry. The artist’s free-form approach to various creative means is also evident in “Carrément bricolé n°4” (2013). 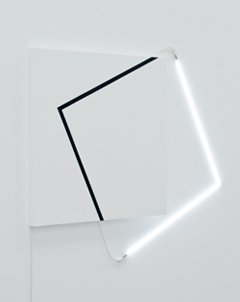 The right angle painted in black on the canvas is completed by a glowing white neon tube to form a square. This very confrontation, or rather conjoining, of the two differently executed angles reveals the possibilities offered by the divergent media. While the black line is bound to the image carrier, the fluorescent tube asserts itself as an independent object. The sculptural quality is especially palpable in the large-format works in the exhibition. Here, Morellet uses fluorescent tubes to “draw” geometric elements such as straight lines or arcs in space. The six 450-cm-long blue neon tubes in “Triple X neonly” create a radiant grid that condenses into a more or less orderly network of lines depending on where the viewer is standing. In “Cercle à demi libéré n°2” (2015), Morellet dissolves the closed, tranquil form of the circle into a dynamic fabric of two adjacent semi-circular fragments. The perspectival overlap gives the installation a physical presence that conveys an impression of bouncy lightness. As in all of Morellet’s works, small irritations and surprising deviations conspire here to lend the underlying geometric clarity a note of whimsy and humor.